I’m back! I took a long blogging break over the holidays, but I’m super excited to be back and I have lots of things to share in the upcoming weeks! I hope you all had a wonderful Christmas and New Years’. 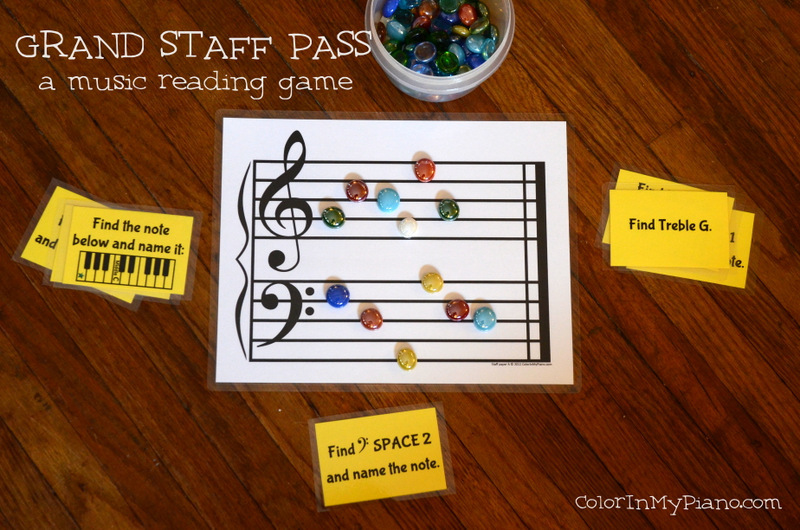 “Grand Staff Pass” is a activity for finding and naming notes on the grand staff. Each student has a printed grand staff in front of them, and must find the notes as indicated on the cards. The cards are passed to the next student, going counterclockwise around the room. The best thing about “Grand Staff Pass” is that it keeps everybody busy at once. Nobody has to wait for their turn, because everyone is playing at the same time! The cards. You can download the free pdf by visiting the Printables > Games page, and scrolling down to “Grand Staff Pass game.” The pdf contains 6 pages of cards, making 48 cards total. One set of cards should be enough for up to about 8 or maybe 10 students — but if you have a larger group than that, you can print the pdf twice. Plenty of glass gems (or other tokens that fit the grand staff printout). You will need at least 15 per student. Ask the students to sit in a circle, and give them each a grand staff. Put a small stack of cards between each student (they do not have to be divided evenly). Instruct students to take a card from the left-hand pile and then follow the instructions on the card. When completed, the card is put down on the pile to their right for the next student. During gameplay, if you notice that a quick student is running out of cards on their left-hand pile, you can take cards from other piles that are rather full and spread them around. Gameplay continues for a designated amount of time, or until the students’ grand staffs are looking rather full. After stopping gameplay, encourage your students to admire each other’s grand staffs. My students were so proud of their grand staffs, filled so colorfully with notes! I haven’t tried it myself yet, but I think that this game would also work very well as a one-student activity during the private lesson. It could be a nice reprieve from traditional flashcard drills. If your student only knows a few of the notes on the grand staff, you can sort out the appropriate cards to adjust the activity for them. Next postJanuary 2013 Piano Party! This is such a perfect activity for the first lesson back after 2 weeks of break..I plan to use it with all my younger students this week. I might ask them to choose just 10 cards, or set a timer and see how many they can complete in a minute or two..or even go to the skittle machine and use the candies they get as tokens.. Sounds so fun!! Many thanks!! I think the Minute to Win It Timer from Wendy’s (that I think you suggested) would be great to use with this game as a lesson starter. After playing it once… I think I’ll challenge the student to beat their own first score :) Thanks for the game! I haven’t tried that game, but perhaps I will look into it! This is such a wonderful game! Thank you for making this available to the public. My sister has really been struggling with identifying the notes on the staff and she is also a hands-on learner. Amy Chaplin mentioned this game in her video this week, so I came to your site and printed it out. My printer, though, printed the treble clefs as a “G” and the bass clefs as a “?”. Is there a way to fix that? I simply drew over them with a black sharpie for now. I’m looking forward to trying this game at my end-of-summer cupcake party! Hi Amy! :) Yes, here’s how to solve the issue: When you download the PDF, be sure to download it all the way onto your computer and then open the file using Adobe Acrobat reader (instead of allowing the PDF to open inside your internet browser). This should do the trick, but please let me know if not!